The Rumson-Fair Haven girls definitely came to win at NJSIAA State Relays on Friday earning gold in four events and the Deptford boys took home their first State Relay title in school history during the Group 2 Championships. For Deptford this was a record setting day in more ways than one. En-route to their schools first relay title they broke their own meet record in the 4x200m and demolished the previous shuttle hurdle relay record as well as the Bubble facility record. The shuttle hurdle squad ran a 29.45 with Rahway in second at 29.81, two of the fastest times in the state by far. 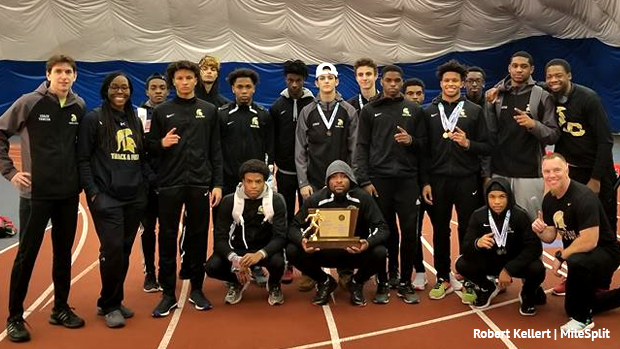 Deptford's performance moved them up to fourth all-time in the state of New Jersey, watch the race and read more about the historic run here, they have big ambitions for that relay. Their 4x200m squad won running 1:32.04, they already lead the state thanks to their 1:30.19 in early January at the Hispanic Games. Their team win, which was hard fought with Rahway 42 to 37 points, also included a second place SMR run of 3:39.03, fourth in the 4x400m, third in the high jump, and fourth in the pole vault. Their vaulter James Lynch had the second highest clearance of the day at 14-0. Rahway worked their way to second overall in the team scores with multiple top three finishes including silver medals in the shuttle and the 4x200m, 1:33.75. Delsea and Haddonfield also had a big night. Delsea won the pole vault in record setting fashion when Nico and Marco Morales vaulted a total height of 29-00 to set the All-Group meet record of 28-00 held by both Toms River North ('08) and Hunterdon Central ('14). Nico made it over 15-06 with attempts at 16-00 and Marco 13-06. Delsea's shot put relay brought home gold as well with a total of 91-03.75, Jake Nwosu 46-08 and Kevin Gilliano 44-06.75. On the track their Sprint Medley team took the win at 3:38.88. Haddonfield won the Distance Medley and the 4x800m with times of 10:34.34 NJ#3 and 8:06.47 NJ#4. They were also second in the pole vault clearing a total of 26-00 with Josh Montana and Kurt Wolff both over 13-00. The Matawan boys set a Group 2 meet record in the 4x400m running 3:24.56 destroying their own standard of 3:26.90 from last year, that is NJ#2 this season. Sparta won the boys high jump with a total height of 11-06 thanks to Jake Galluccio over 6-00 and Chris Johnson 5-06. The Rumson-Fair Haven girls scored 57 points to lead the meet by 23, they won four out of six track events and placed second in the other two. The wins came along in the shuttle hurdles, 32.83 NJ#6, the sprint medley, 4:18.63 NJ#6, the 4x800m, 9:44.50, and the distance medley, 12:34.68 NJ#6. Silver medals were won during the 4x200m, 1:47.75, and sprint medley, 4:18.63 NJ#6. Lily Orr, Eliana Swell, and Campbell Devlin were big players in their team's victory but as stated in their interview above this was a well rounded attack by multiple girls stepping up on the roster. Swell, racing just her second 1600m/mile ever, made a comeback in the DMR to take the win and extended the gap in the 4x800m for first place. Orr anchored the 4x200m and 4x400m and Devlin competing in three events despite not feeling well including the winning shuttle hurdle. This is two years in a row for the Rumson-Fair Haven girls and their third overall team title at the State Relays. Elsewhere for the girls we saw a wicked comeback kick in the sprint medley relay by Victoria Vanriele, she finished off running 2:13.6 for Governor Livingston win at 4:14.54. Delsea won the 4x200m with a 1:47.62. Haddonfield earned the win in the pole vault relay clearing 18-06, Jennifer Scott led the team and the event at 10-06 and her teammate Robin Rosen 8-00. Pinelands Regional threw 71-00.25 to win the shot put, Elizabeth Makar 37-07.25 and Bianca Trice 33-05. The high jump was taken by Ramsey with two 5-00 jumps by Carolyn Coletti and Kaela Monte.